Touch screen with changeable skins - select the skins of your choice to bring your switches to life. A smart choice, a lifestyle, a status symbol. A class above others. The new Senzo Touch is the switch for the new generation of Senzo Smart Homes! Smooth, touch-.. The new Senzo Touch is the switch for the new generation of Senzo Smart Homes! .. 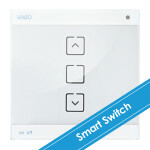 The new Senzo Touch is the switch for the new generation of Senzo Smart Homes! Smooth.. The new Senzo Touch is the switch for the new generation of Senzo Smart Homes! Sm..